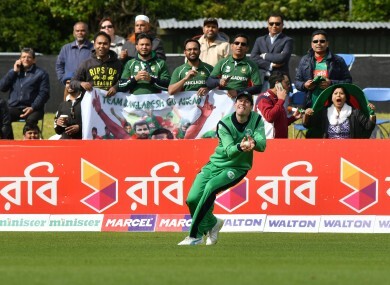 BANGLADESH BEAT IRELAND by eight wickets in the one-day international tri-series game in Malahide today with opener Soumya Sarkar finishing 87 not out. Ireland were bowled out for just 181 in the 47th over before Bangladesh eased to their target with 22.5 overs to spare. Email “Bangladesh beat Ireland by eight wickets at Malahide”. Feedback on “Bangladesh beat Ireland by eight wickets at Malahide”.